Medical journals typically refer to the age bracket of “over 65” when discussing the mortality or survival rates of cardiorenal syndrome. But a good question is if the mortality or survival rates of cardiorenal syndrome differ when the elderly age group is further broken down, such as 65 to 74; 75 to 84; 85 to 90; or 90+. Usually, when survival or mortality rate is talked about in a paper, it goes out only as far as 30 days. 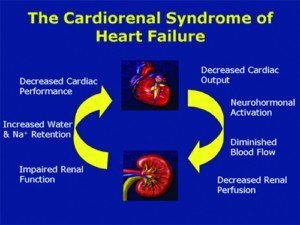 So for instance, a paper might describe the survival rate for cardiorenal syndrome in patients over 65 as being around 80 percent. Another study might put it at around 90 percent. • Would these percentages change if only those patients over age 85 were considered? After all, “over 65” may include a good number of patients in their late 80s for that particular study population. • How much would those percentages change if the patients were followed from day 31 to day 60? Or 90 days out, for that matter? For example, an ejection fraction of 17 percent, plus renal impairment that shows as 3.0 for the creatinine blood test, are more predictive for outcome than old age. Of course, a 70-year-old with an EF of 17 percent and creatinine of 3.0 will probably have a better shot at 90 day survival than will an 88-year-old – all other things being nearly equal (e.g., neither smoke, both take a drug for high blood pressure, both have a BMI of 24). 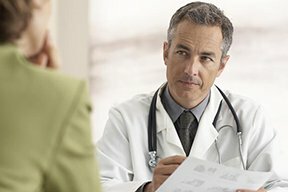 “First, patients tend to experience the onset of heart failure in their late 60s or early 70s, and they often die in just a few years,” says Dr. Mills. In other words, there are no studies that look at the survival rates, let alone pinned down to 30 days, of people with cardiorenal syndrome who are specifically between, say, 80 and 89, or 90 to 93. It’s “over 65,” and most of those patients whose data are collected for these studies are under 80. Dr. Mills continues, “Second, even when the major risk predictors of poor renal function and low ejection fraction are present, 30 day survival does not mean much. “If we start timing with an admission to the hospital with heart failure, we see most of the first-year deaths occurring within the first six months. And that survival time, for those six or fewer months following discharge from the hospital, aren’t necessarily pretty. The patient, though surviving, may be leading a life of extreme fatigue, frequent issues with shortness of breath, and numerous trips to urgent care due to concerning symptoms (e.g., weight gain overnight of five pounds due to fluid buildup). They may even be spending most of their waking hours in bed or in a wheelchair due to weakness. “Late in life, we see a different spectrum of disease processes, particularly degenerative valve diseases, causing heart failure. Cardiorenal Syndrome in Elderly: Who Gets Drugs, Who Doesn’t?